Scientists have discovered the existence of a very peculiar 430 million-year-old fossil. The fossil which is very tiny is the creature known as Sollasina cthulhu. The creature had 45 tentacle-like tube feet that it used to crawl along the floor of the ocean and capture food. 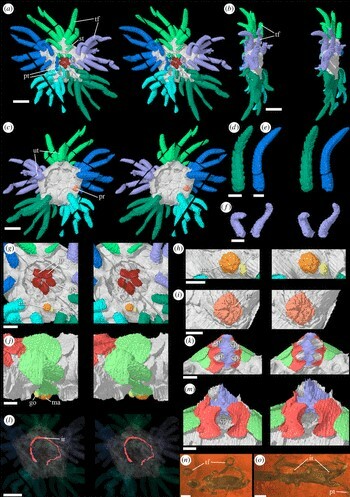 The team of researchers have identified a new species of sea creature that crawled along the sea floor hundreds of millions of years ago (an international team of researchers, including from Yale, Imperial College London, Oxford, and other institutions). The researchers explain Sollasina cthulhu was absolutely covered in tentacle-like “arms.” Not five or ten arms, but a full 45 individual limbs that scientists now believe it used to crawl across the ocean bottom in search of food and safety. According to bgr.com “the creature was related to modern sea creatures like sea cucumbers, urchins, and of course starfish, but it had some unique features that clearly set it apart. The biggest difference between S. cthulhu and similar species we see today is that the ancient animals boasted armored limbs, whereas starfish and cucumbers have “naked” limbs”. [Because of its diminutive size, with a central body unit measuring only around an inch across, it wouldn’t exactly have been an intimidating sight in an ancient ocean. It likely didn’t pose much of a threat to its fellow sea creatures, and probably spent the majority of its life just searching for tiny bits of food to keep it going, while its armored body helped it fight off would-be predators].